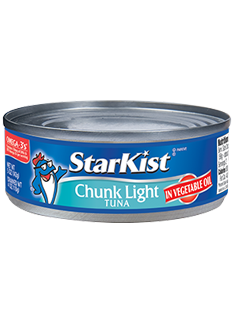 The best selling tuna in the United States‡, StarKist® Chunk Light Canned Tuna is carefully packed and cooked to preserve the naturally mild, trusted tuna flavor people have come to expect from StarKist®. Our Chunk Light Tuna in Oil is packed in soybean oil for a mild flavor for those who prefer tuna packed in oil instead of water. Our 5 oz. Chunk Light Tuna in Oil contains 110 mg per serving EPA and DHA omega-3s. Our 12 oz. Chunk Light Tuna in Oil contains 80 mg per serving EPA and DHA omega-3s.